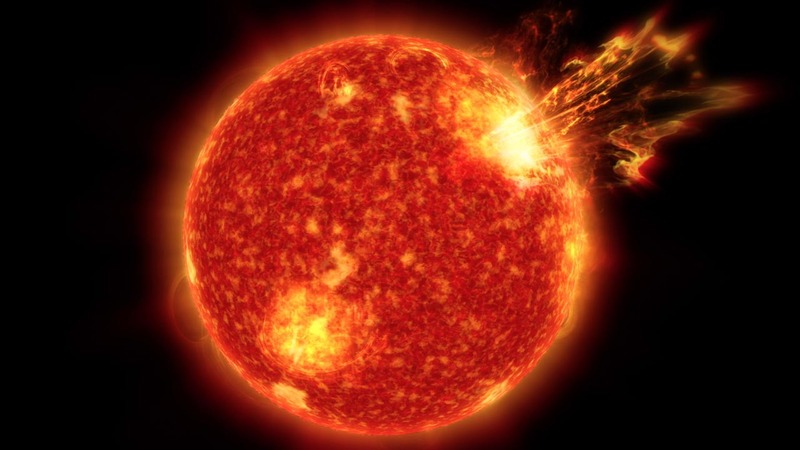 What would happen if the Sun suddenly exploded? This was the question puzzling Albert Einstein, shortly after his discovery in 1905 of his special theory of relativity with its famous equation e=mc2. 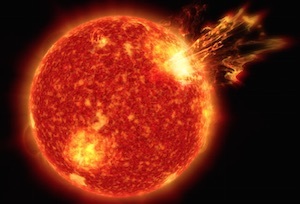 Since the Sun is so far away it takes light eight minutes to travel to Earth, we wouldn't know about such an explosion straight away. For eight glorious minutes we'd be completely oblivious to the terrible thing that had happened. But what about gravity? The Earth moves in an ellipse around the Sun, due to the Sun's gravity. If the Sun wasn't there, it would move off in a straight line. Einstein's puzzle was: when that would happen – straight away, or after eight minutes? In the beginning of twentieth century Isaac Newton's theory of gravity (which had been around for nearly 250 years – you can read more about it here) was considered the bedrock of science. It was an incredibly successful theory, explaining the movement of planets and moons and accurately predicting the passage of comets. According to Newton's theory, the Earth should know immediately that the Sun had disappeared. But Einstein had shown in his special theory of relativity (you can read more about it here) that nothing can travel faster than the speed of light – not even the effects of gravity. The speed of light was the speed limit of the Universe. And as the light from the explosion would take eight minutes to reach the Earth, the change in the gravity must take at least the same amount of time to be felt by the Earth. Einstein's solution to this puzzle was to completely change the way we understood the Universe. Up until 1915, people thought of space as an inert stage on which the laws of physics play out. We could throw in some stars or some planets and they would move around on this stage. But Einstein's revolutionary realisation was that space isn't as passive as that. It is dynamic and responds to what's happening within it. If you put something heavy in space – let's say a planet like Earth – then space around it gives a little. When something else moves close to the planet – say the Moon – if feels this dent in space and rolls around the planet like a marble rolling in a bowl. This is what we call gravity. The presence of a heavy object like the Earth, moreover, doesn't only affect space: it affects time as well. Einstein realised that space and time are not separate entities, but instead just different aspects of something called spacetime. This fabric of the Universe dances with matter as galaxies orbit and spiral. Stars and planets move, causing spacetime to bend in their wake, causing other stars and planets to move, causing spacetime to bend in their wake. And so on. This was Einstein's great insight – gravity is the manifestation of the curvature of spacetime. In 1915 Einstein published these discoveries as his general theory of relativity. It is now known as the theory of gravity, superseding Newton's. We know that general relativity is true because Einstein's theory made a number of important predictions that Newton's theory didn't. One of them is that light is bent by gravity. This was observed in the 1919 eclipse of the Sun, providing stunning proof of Einstein's theory and creating newspaper headlines that were the beginning of Einstein's public fame. This article is based on a number of Plus articles including Einstein and relativity and What is general relativity?. You can read more about Einstein and his general theory of relativity and the maths behind it in our collection of articles and videos. This article is part of our Stuff happens: the physics of events project, run in collaboration with FQXi.